move into the second chamber, close the middle gates and then open the bottom paddles to empty the half full lock into the pound below. And no, it was not cold - this is a Blue Peter photo - ie one I took earlier!! There are another three locks to negotiate along with three swing bridges, one of which is in the middle of the last lock. Then there is the dreaded M5 culvert. There had been a lot of rain the night before, so would we fit? As it has been so dry and there were five of us to act as ballast in the bow we risked leaving the cratch up. The water was certainly higher than it had been for a while. Chris inched forward very slowly. There is a gauging board at each end - hit it and you will have problems. The board below is actually at the end coming from Droitwich and we reckon it's height is spot on. At the other end the board is slightly low, so it swung as we went under it. On Chris went inch by inch and phew - we made it with about 2 inches to spare. I was too busy checking the clearance to take any photos! Without the extra people we would not have made it of that I am certain. By the time we came home the water had dropped by several inches, so a much less stressful passage. So who were the crew? Well there was Gil complete with crutch as she has hurt her knee. There was some doubt if she would make it, but thankfully things are improving and she coped valiantly. Then Dee and her husband Steve (with the hat) and Laurie, Gil's husband. 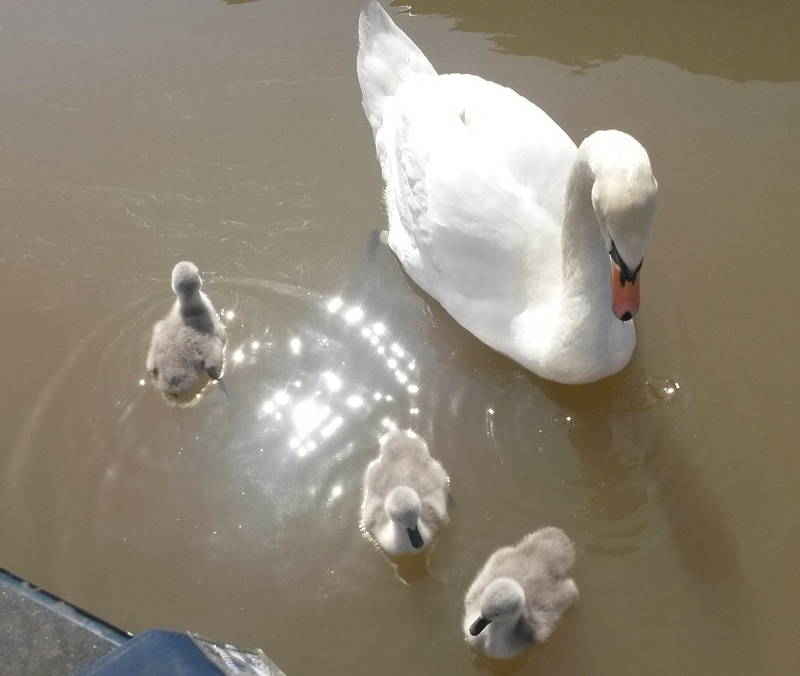 Once safely moored in Nethewich Basin we headed to The Gardener's Arms for lunch where a table was booked for 1pm. If you come this way and want to find the pub the alley way below is the one you are looking for! Many hands really did make light work and we were an hour early. No problem they said and we sat ourselves under an awning in the garden. An excellent meal was enjoyed by us all along with a lot of chat. Steve and Laurie both had a turn on the helm, however I failed to get a photo of Laurie in action (sorry!). At the last lock we met up with some people Chris and I had helped on Tardebigge last week when they were on a hire boat. We handed over the camera to get this shot of us all - well nearly all. Steve had miscounted and walked on to the next non existent lock! All too soon the day was over, tea had been drunk and our guests departed. All that was left was for us to pack up our bits and bobs (we had stayed on board on Wednesday night), lock up the boat, check there is enough money in the electric meter and head home to prepare for our trip to France (we leave on Thursday). It will be a while before we are back on the cut in the UK. Unusually Monty failed to get into any of the shots, so here is waiting patiently for Chris to come back with the car from emptying the toilet, so we can load and head home. Over a month has passed since we were last afloat and this should have been written ages ago, but other events always seemed to have priority. Still better late than never. It is long, so feel free to skip bits or ignore altogether - they are primarily written for our benefit as a record of our time afloat. 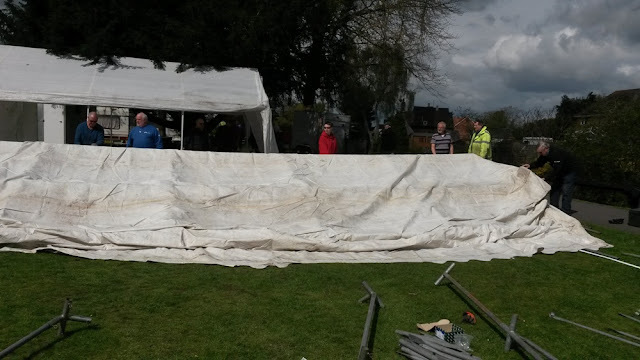 Having finally settled in to our mooring in Droitwich we had several days of 'down time' before we were due to help with the preparations for the annual St Richard's Festival. So what did we do? Well recovery from Chris's fall and some tlc for my back were on the cards, so we were both glad of the respite. There were plenty of Monty walks including one back to the marina to get our car which gave us the freedom to roam. We had, of course, to do the trip in reverse before we left. 2 1/2 lbs of salt per gallon - ten times stronger than sea water and rivalled only by the Dead Sea. and in Vine's Park through which the canal runs. The park area is where most of the brine pits and wells had been situated. This is a replica of one of them - The Great Upwich Pit. There is also a replica of one of the old Wyche Barges which has lots of information about the past salt industry, but it is also a rather nice seating and picnic area. My most interesting walk took me along the Barge Canal from Vines Park to Salwarpe. The weather was clement and once out of the environs of Droitwich we hardly saw a soul. Birds singing, bulrushes swaying in the breeze all marred a little by the constant drone of traffic from the ever present M5. Both with these signs. You would expect them to have been a duplicate of each other, but there is one glaring difference - the first has a spelling error and they have not done much better with the second. And ventured to the second access where we had more luck. This is a great place to view the reed bed, but there were no birds around and did we find any of those cows? Sadly no. We got as far as bridge 7 at Salwarpe before retracing out steps back to the boat. 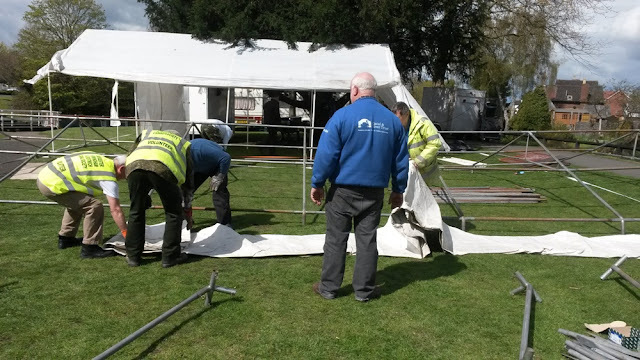 That was our week in brief, but we were in Droitwich to help out with the festival. So just how much was there to do to ready the site for the many visitors they hoped to attract? A lot! The work is mostly undertaken by volunteers from the Worcester Birmingham & Droitwich Canal Society (WBDCS) along with some C&RT staff and volunteers. We are members of both, so were we doubly useful - probably not, but we did our bit. 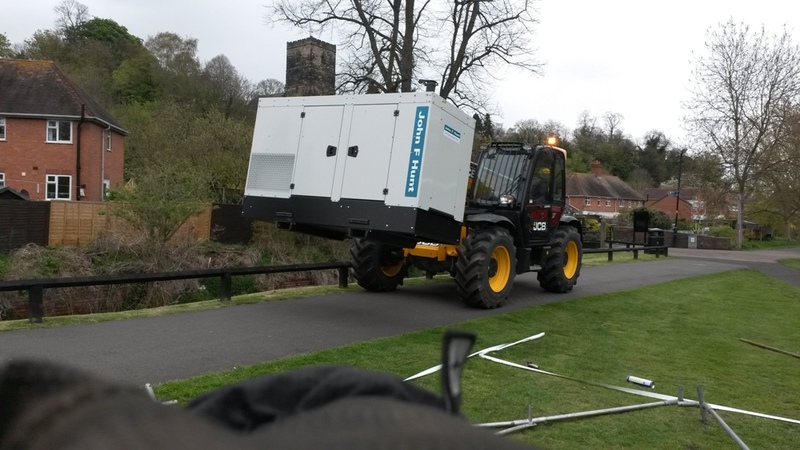 All the equipment needed to be loaded into two 7.5 ton trucks from where they are stored - something we were not able to help with. So what exactly are we talking about? Well all the electrical equipment, lights for the site, lighting for the marquee and stage, bar equipment, table and chairs, fire extinguishers, marquees plus they have 4 trailers and two caravans to move and only two people with tow bars. 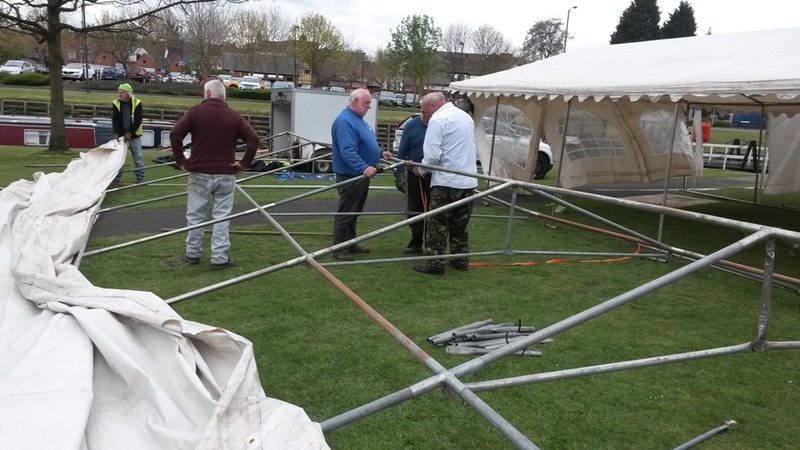 Thursday morning saw us ready and willing for whatever needed to be done - first things first - get the marquees up before it rained! 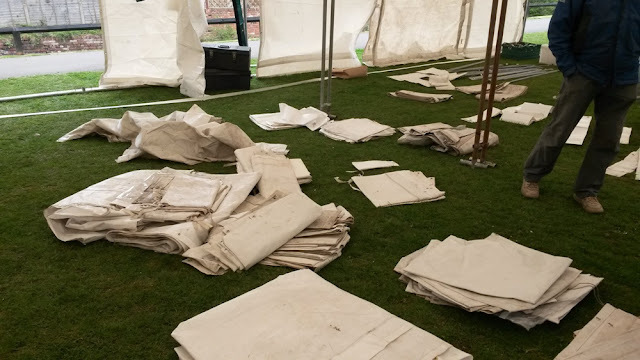 I did wonder how on earth the poles and connectors were all sorted out when we helped dismantle the site after the Worcester Festival last June - scroll to the bottom of this post for the reverse of building a festival. The answer is carefully and with great precision. There are long poles and shorter one, connectors with three or four 'prongs' and they all have to be in the right place. The man with the clipboard is the Chairman of the WBDCS doing a very important job - taking orders for sandwiches to be sourced from The Gardener's Arms. Bacon and egg for me and very welcome it was too. Every pole has to be fully inserted into the relevant connector - if a hammer is not man enough, the ratchet and strap have to be deployed. Once the frame of the roof is built the roof itself was unrolled. pulled over to cover the frame. The next step is for the side poles to be attached and the roof raised. First one side with a person at every joint, then the other. I was too busy helping to take photos! Do, however, note that sky! They clip onto the roof with small bungees - I could really have done with being 2 inches taller!! My tip toes saw a lot of action. 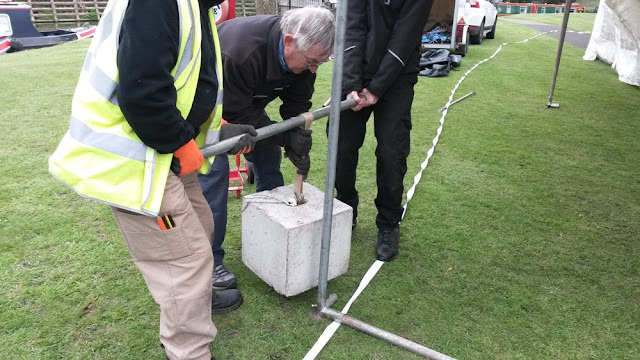 As you will have seen most volunteers were of a 'certain age', however, thankfully we did have one young fire fighter (on the right) to help with the really heavy stuff which included positioning the cement blocks at strategic points to ensure nothing blew away. 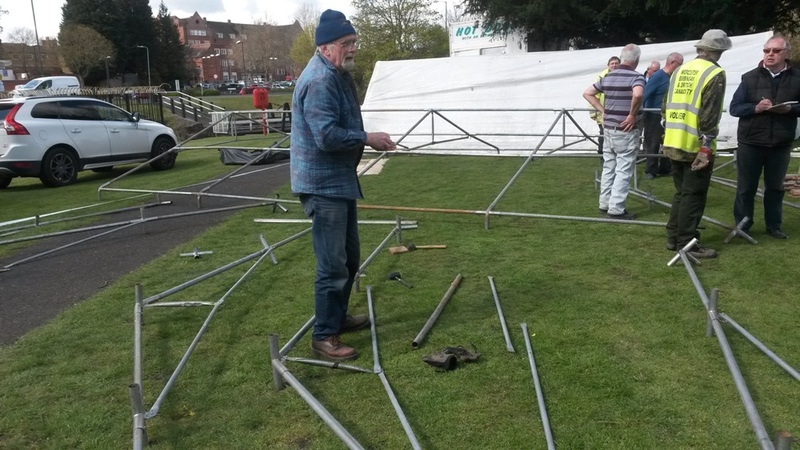 The 'headless man' at this end is the main volunteer coordinator and I have to take my hat off to him - the hours he puts in are almost endless. In fact there was a core of folk without whom none of these festivals would get off the ground. Which is slowly lowered into position. 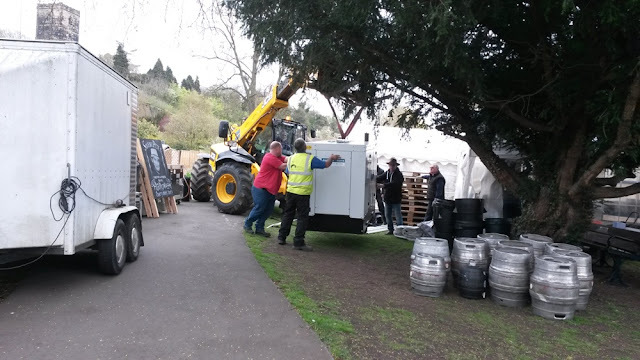 The beer has arrived which is all to the good! 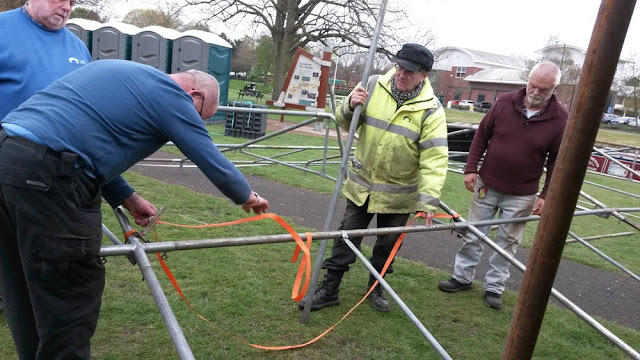 One of the final pieces of the puzzle is to erect the security fencing - most of which is taken down each morning and re-erected at the end of each evening. It was many hours of hard work (we only did half a day on both Thursday and Friday, but every little helps I guess). Once back on board with the marquees safely up the threatened rain arrived. So all was ready in time for the opening of the marquee for beer and bands by 5pm on Friday. Saturday morning saw the official opening with a ceremony performed at the Great Upwich Brine Pit. this painting opposite Netherwich Basin done by local children. I gather it has become a tradition at this festival for some of the adults to get in on the act on the last evening. This is one of our local C&RT Managers who spends the entire weekend in charge of the sound system in the marquee. He is also a point of contact for the rest of us if he is needed. I could hardly leave Barry out! Seen here taking a few minutes off to admire this rather magnificent Barn Owl. The people did come despite the cold - and oh boy was it cold. On the Thursday when we were busy erecting marquees I was wearing a thermal vest, a polo shirt, a sweatshirt and a fleece and I was so cold I went back to the boat to add an extra long sleeved thermal vest to the layers! I was still cold and I am not usually prone to the cold! Unfortunately we also got a lot of wet stuff. This was Saturday and it got a lot worse on Sunday and Monday. 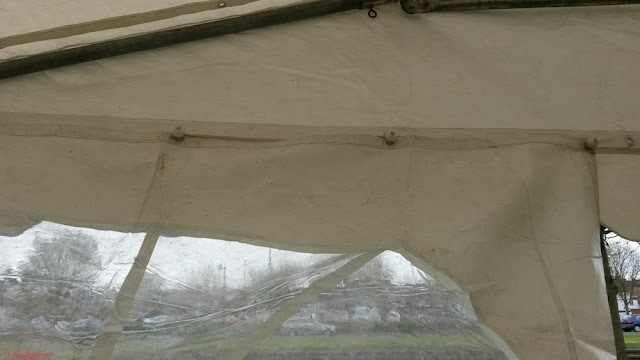 At one point on Monday I dived into the marquee to avoid a particularly heavy shower along with nearly everyone else attending. The comment from the band leader was 'Wonderful - just what I like - a captive audience!' The volunteer is the 'headless man' in the photo above placing the cement block - he was trying valiantly to stop the rain cascading onto the electrical equipment at the back of the marquee. He really was ever present throughout the entire event. We spent Sunday and Monday afternoons on the C&RT stand - our main duty was to operate the main swing bridge into the park and then the lock and swing bridge to exit the park for all moving boats. This swing bridge has always been notoriously hard to unlock and even worse to re-lock. Running repairs were done, but not to any great effect. We shall see this week if a more permanent solution has been found. On Monday I entered Monty for 'the most handsome dog' in a little fun show they have each year. He behaved impeccably which is more than one Staffie did - there was a completely unprovoked attack on a 5 month old GSD. Appallingly they were not told to leave and the owner had the brass neck to stay put! Needless to say they did not win and it was noticeable that everyone else gave them a very wide berth. It was the GSD pup who won (and quite rightly so, not just in sympathy as he was gorgeous). Monty, well he got a highly commended, but it was so wet by the end he did not seem very impressed with his rosette! We also had a go at a fun agility round - very noisy as he barks with excitement all the way round. The weather just got worse and worse, but he enjoyed it. My friend took the pictures despite the rain - thank you Thalia. Above and beyond the call of duty! To mark the end of the festival there is a mass duck race. I think they sell around 1000 ducks, so at a pound a go they are quite a valuable asset. This is just a taste - there was a lot more going on. We had a great time despite the weather. We did one late night stint helping to erect the security barriers, but compared to some volunteers our help was fairly small beer. I will never again attend any function like this without appreciating the amount of work that goes on before, during and after and, in this case, probably 95% done by volunteers. My bargain of the year - Chris spotted this small brandy glass on one of the stalls. I asked the price - 20p!! It is safely with the rest of the glassware on Tentatrice. And all that was left to do was sort this lot out. 85.5 miles, 207 locks, 13 swing/lift bridge and 10 tunnels. So what have we done since then? Apart from grandparent duties (well not much of a duty as we had great fun) over half term, litter picking and some lock keeping I am not sure, but we always seem to be busy. Watch this space for a short boat trip due this Thursday.